​They are an important part of every athlete's make up. Emotions are both good and bad but they are controllable by you. Great athletes use Emotions as motivation to improve, whether it be skating, fitness or your shot, improving your skill means improving one's self. Improvement does not come easy, it requires work, which pushes one out of their comfort zone. Pushing your effort out of your comfort zone puts you in an uncomfortable position. We at times get complacent, we are happy when we make a team, are on the second line, are a top 4 D man pairing, Great athletes aren't satisfied with that, they challenge themselves to improve, they strive for being the best and they work to become the first line player or the top D man pairing or the starting goalie. Failing to manage your emotions can and will lead you nowhere. Allowing them to control you will lead to reckless play, playing out of position, not allowing you to focus on your responsibilities, that will lead you to lose your Coaches trust, your teammates may think you to be selfish and most importantly it shows a lack of maturity that is unacceptable in a team sport. Proper emotional management though allows you to stay the course, see the big picture of what you and the team are trying to accomplish and focus on acting and not reacting to situational things happening in the game. Do my emotions make me apologize for my actions? Do I look for instant revenge when I feel a call has been missed on me or an opponent has gotten the best of me? If you answered yes to either of these 2 questions you may need to focus on controlling your emotions which starts with a little self-control, self-control leads to self-discipline and self-discipline leads in most cases to successful goals. When you are in control of your Emotions you will turn them into Goals both on and off the ice. Faceoffs, the Important things to think about. Faceoffs are such an important part of the game, yet they are so often overlooked. ​Like skating, you do not just become Great, you must develop and learn the skill, practice then put those lessons to work for you. Everything happens when you have control of the puck, you act rather than react, which in our game makes the difference between winning and losing. Practice these few simple Tips explained here, develop them consistently and you will soon gain the Coaches trust and be the one that is selected to take the Important Draws on your Team. Are you prepared for the physicality of the draw? 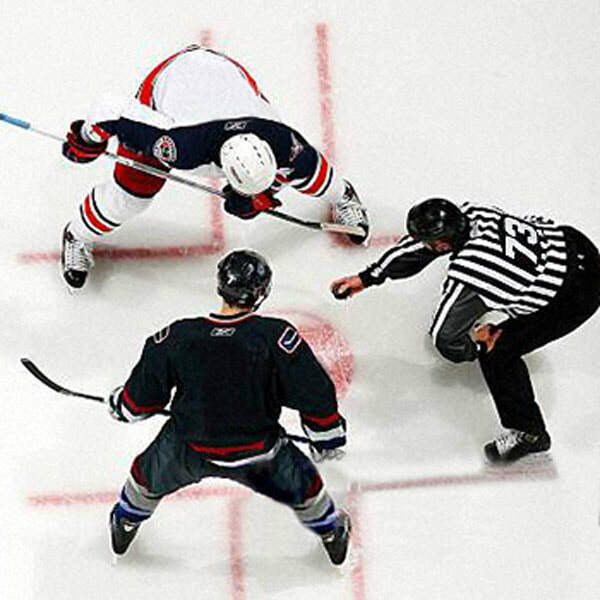 What's the first signal the Referee is dropping the puck? These are just a FEW of the important things you need to know when taking a draw. Work on this skill so you have another tool to add to your games toolbox.